Concrete foundation repair of cracks caused by ground settlement is a highly specialized field. This type of cement foundation repair is costly because of the risks and difficulties of work involved. 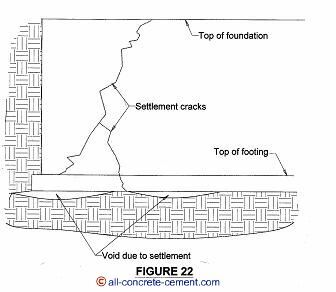 Cracks originated from ground settlement occur when the soil below footing settles causing the footing and foundation wall to follow along with it. When this happens either new cracks develop or existing shrinkage cracks widened and deepened. Additional sign of settlement cracks include cracks at drywall and/or windows, doors not open or close properly . Figure 22 shows how differential ground settlements either create new foundation cracks or worsen existing shrinkage cracks. If ground settlement occur at a corner of a house where two or more walls meet, it is highly likely that all walls are affected. As shown on figure 22, repairing of cracks caused by ground settlement will not become permanent until the void left by soil settlement is addressed. The two biggest challenges for this type of repair are finding where the settlement occurred and restoring the displaced footing without damaging any structural element of the house/building. For these reasons I discouraged DIYers from attempting to do this without consulting with a structural engineer first.